The hotel was perfectly located on Fira to Oia path and had a beautiful view of Skaros rock! Unbelievable stay. The owners are welcoming and friendly, in fact, we became very good friends with them during our stay. Georgia and her staff have gone out of their way to make sure that every single details were addressed so that my husband and I could have the best time on this beautiful amazing island. She went out of her way to orchestrate our mode of transportation was taken care of and also that we would know exactly where to go to discover all the special features of this island. And the staff worked round the clock to keep our room perfectly cleaned so that when we got back to the room we would have a fresh supply of new towels and toiletries. Absolutely fabulous host here! Georgia the owner, her son Marcus, her daughter Sandy and Cristos were very kind and helpful hosts. They helped us so much with arrival directions by car, parking our car, carrying our luggage for us, printing our flight boarding passes and even helped us order a delivered local Greek meal to enjoy on our balcony one night to watch the beautiful sunset. 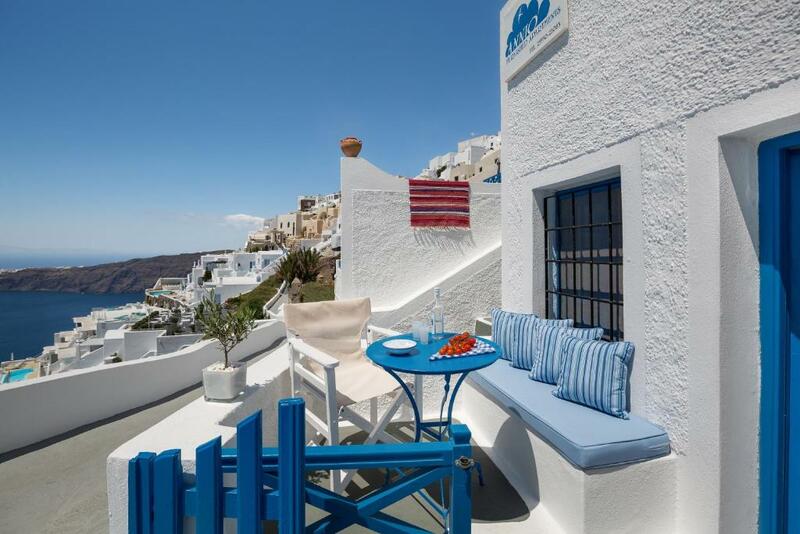 The views from your balcony are simply awesome, the rooms are comfortable and clean and the location was perfect between Fira and Oia. 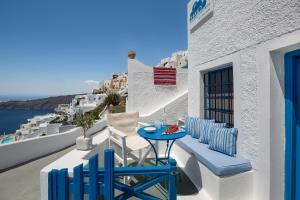 Short 20 minute walk to Fira along a beautiful path and a short drive or taxi to Oia. So nice to stay at a family owned and operated hotel as opposed to one of the large corporate types. The view was just as amazing as the staff! Plus there were a ton of things to do and places to eat within a 10 minute walk! The amazing caldera view from the terrace. Georgia was fantastic! Cave studio 2 was very cute. Conveniently located to restaurants, markets, transportation, and the waking path between Fira and Oia. The property was fabulous in an amazing position right on the caldera rim with, in our opinion, the best view of the sunsets in Santorini. It was an easy walk down the stairs from the parking area at the top where you can park or get the bus nearby. The room was lovely, nicely decorated and very clean and I loved the fluffy bathrobes provided. Our host Georgia and her son were both lovely and were very helpful offering great suggestions of things to do, ATV hire, restaurants etc. Nothing was too much trouble for them and there was always Georgia, her son or her dad around if we needed anything. Our room was cleaned every day and fresh towels provided. At the end of a busy day sightseeing it was great to come back and cool off in the spa and wait for the sunset. We would definately recommend staying here as its a great place in a great location. The place is in a great location and the staff were very nice and flexible in check out. We truly enjoyed our visit. Everything. The location and views were prime. The hostess, Georgia, was the kindest human alive. The room was spacious and fully-equipped for all our needs. Excellent location, phenomenal views could not have asked for a better room in Santorini. The staff was very helpful, polite and accommodating. We spent every evening on our fabulous patio. The sunsets were the BEST with no obstructed view or crowds to navigate through. Our kitchen was fully equipped with everything needed and a market within walking distance. Which made it very easy to make a delicious meal to enjoy out on the patio table. Love Love Love Annio Flats!!! We will stay there again in the future. Lock in a great price for Annio Flats – rated 9.5 by recent guests! 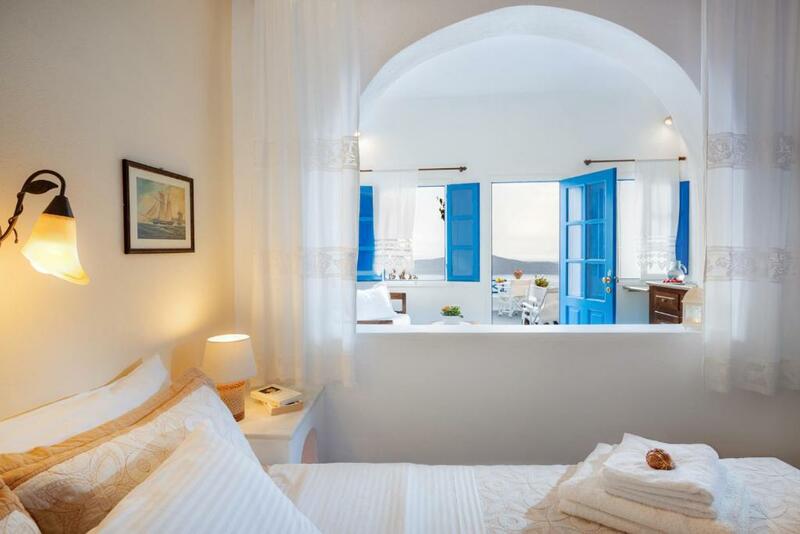 Cycladic-style Annio Flats is located in Imerovigli at the highest point of the Caldera. 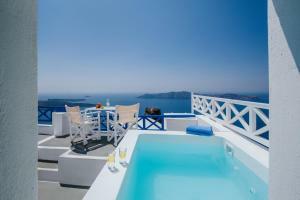 It offers apartments with balconies and stunning views to the Aegean Sea, Skaros Castle and the Santorini volcano. All air-conditioned accommodations is traditionally decorated with built-in stone beds and carved wooden furnishings. 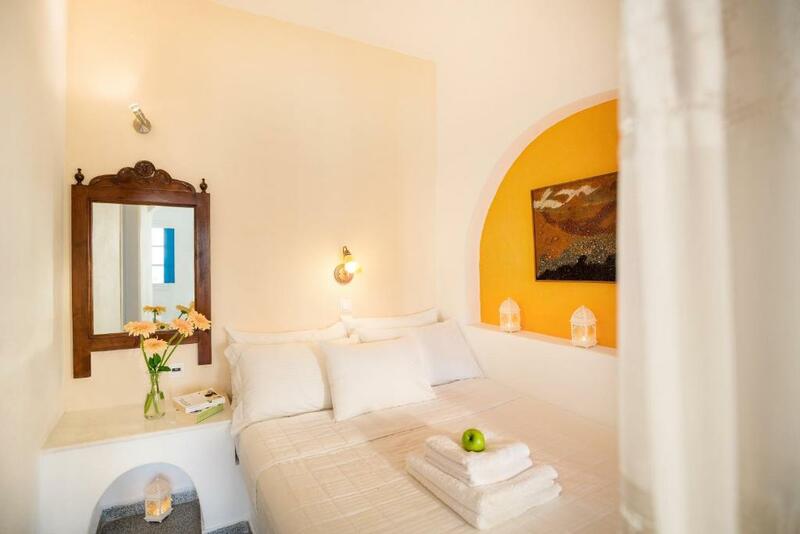 Some rooms have vaulted ceilings in the cave-style of Santorini. Apartments include free Wi-Fi and a seating area with a satellite TV. Each has a kitchenette with a fridge and a dining area. Shops and taverns are 350 feet away. The lively Fira Town is less than 1.2 mi away and a bus stops a 3-minute walk from the Annio. Staff at the tour desk can arrange car rentals and excursions to Oia 5.6 mi away. Baxedes Beach is at 3.1 mi. 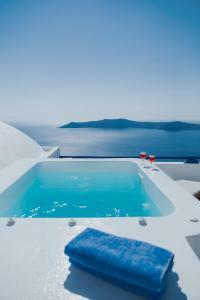 뀐 Located in the top-rated area in Imerovigli, this property has an excellent location score of 9.9! When would you like to stay at Annio Flats? Traditionally built and styled apartment with a bedroom, seating room, kitchen and a veranda. Please note that some apartments are fitted with 2 double beds and others with 1 double and 2 single beds. 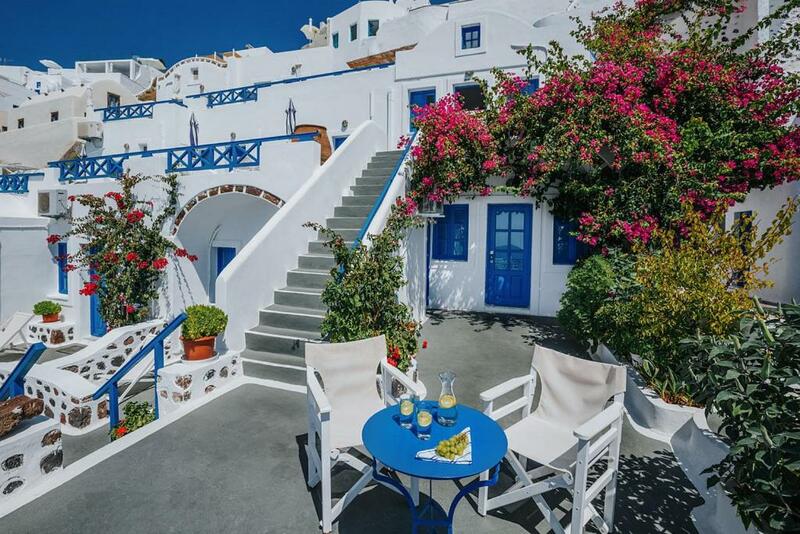 Traditionally built and styled apartment with 1 bedroom, seating room, kitchen and veranda enjoying views of Oia village and the volcano. 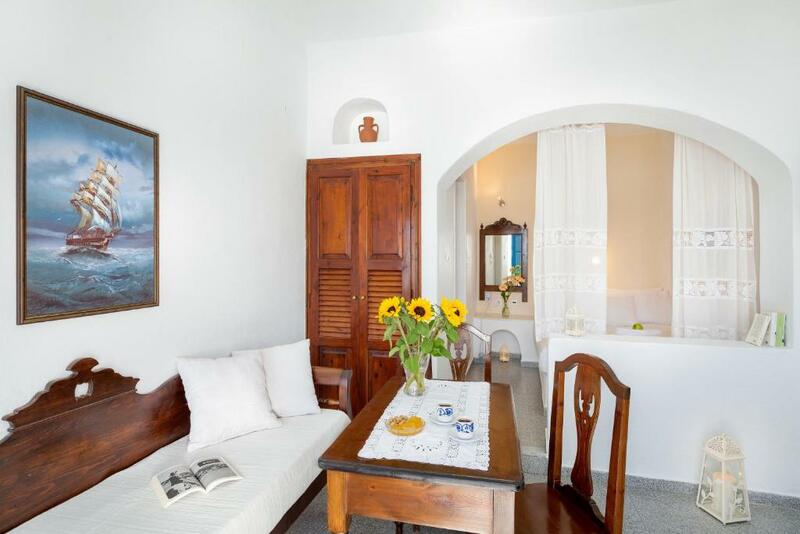 This studio features a balcony with Caldera views, patio and tile/marble floor. This apartment has a bathrobe, kitchenware and stovetop. Opening to a 50-m2 balcony with Caldera view and outdoor jetted tub, this suite features a seating area, a kitchenette and a bathroom with shower. House Rules Annio Flats takes special requests – add in the next step! Children 10 and older are allowed at this apartment. Annio Flats accepts these cards and reserves the right to temporarily hold an amount prior to arrival. Please inform Annio Flats of your expected arrival time in advance. You can use the Special Requests box when booking, or contact the property directly using the contact details in your confirmation. Just a lot of steps going down to the property. It was difficult especially with luggages but somebody will help with the big luggages. The view was spectacular just as you open the door of the flat. The hosts were friendly and helpful. We made full use of the small kitchenette. 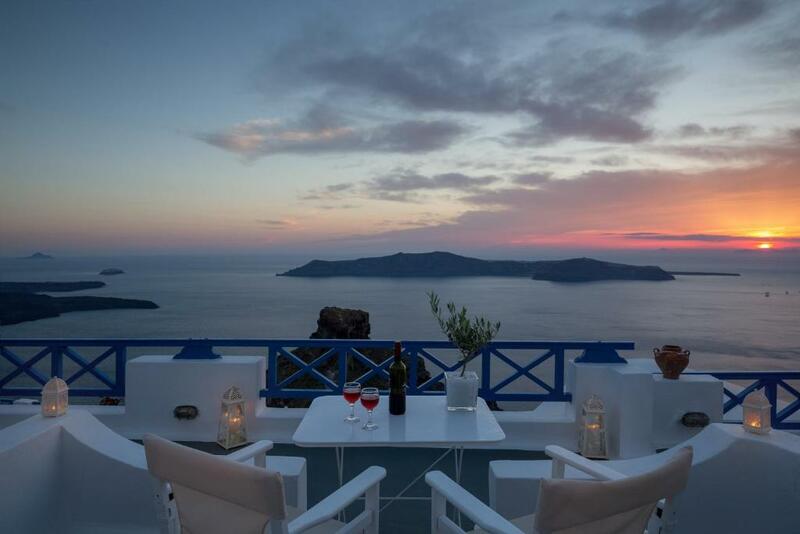 The location of the flat is very beautiful, the view from the flats is just breathtaking, loved the sunset and the Santorini view from the apartment. The apartment has a proper kitchen where you can cook your own food, located near Fira which can by reached by foot in 20-25 mins. The host Georgia was very very nice, helped us with the local information and provided all the necessary help. I honestly couldn't really say anything bad about this property here. If I had to pick anything negative about our stay, it would simply be that I didn't get the best pictures of the sunset during our stay and that's because it was too foggy at this time in October. But that was something unexpected. The view is spectacular, the location is perfect and the staff is so amazing. We will be coming back for sure! 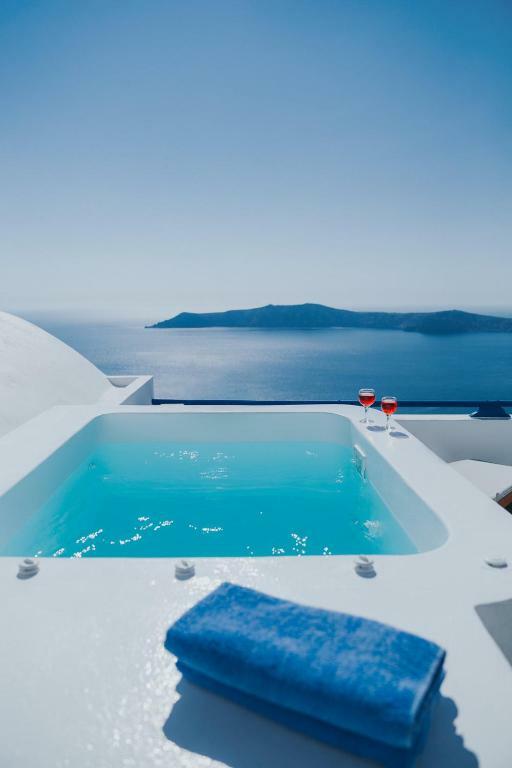 It's all you need for a perfect trip to Santorini. The staff went above and beyond to meet ALL of our needs. Late night check in and check outs and last minute travel changes were met with such ease it really made us feel like part of the fam. The bathroom ceiling is approximately six foot tall. It’s about 90 steps up from the rooms to the town. You have to be in reasonably good shape to stay there. Georgia, the owner, was wonderful. Anything you need, she would arrange it. She really cared.